Here’s something you probably won’t find in any other grocery store outside the Bristol Farms in Newport Beach: a former major league pitcher manning the seafood counter. And it’s no publicity stunt. Though Dennis Lamp fields the occasional autograph request, most shoppers seem to have no idea that the burly, outgoing man handling their halibut once came within three outs of pitching a no-hitter against the Milwaukee Brewers. 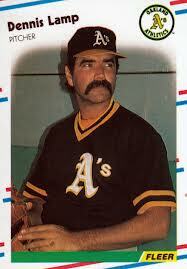 Lamp, 58, was not hired to glad hand or tell tales of his 16 seasons in the majors from 1977 to 1992. He was hired to work. If fetching flounder or scooping scallops in a grocery store sounds like a comedown for someone whose one-time career ambition was to pitch in the World Series, so be it. Lamp doesn’t see it that way. Though a 1999 divorce rocked him financially, the father of three says he is not broke. He made about $4.5 million in the majors. “I just enjoy working,” he says. Sounds fishy to me. Now where’s my bow tie? That was bad. I like that he almost completed a no hitter against the Brewers.